Pale Foxes have a body length between 40 and 45 cms (15.7 - 17.7 inches), a tail length between 25 and 30 cms (9.8 - 12 inches) and they weigh between 2 and 3 kgs (4.4 - 6.5 lbs). They are pale brown or sandy in colour and their bushy tail has a black tip. Their muzzle is narrow and they have large ears with rounded tips. Pale Foxes can be found in the Sahel area of Africa. They are social animals and they live in large, extensive, communal burrows. They are mainly active at night. Pale Foxes are omnivores and they mainly feed on rodents, lizards, birds, insects, eggs, fruit and vegetation. 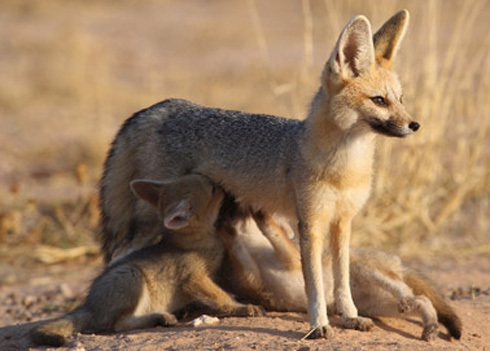 After a gestation period of 51 - 53 days, Pale Foxes give birth to 3 - 6 cubs. At birth the cubs weigh approximately 75 g (2.64 oz) and they are weaned when they reach 6 - 8 weeks old. Little is known about predators of the Pale Fox. Pallida means pale in Latin.